It’s fair to say that we’re all very used to the notion of one bike, one builder. 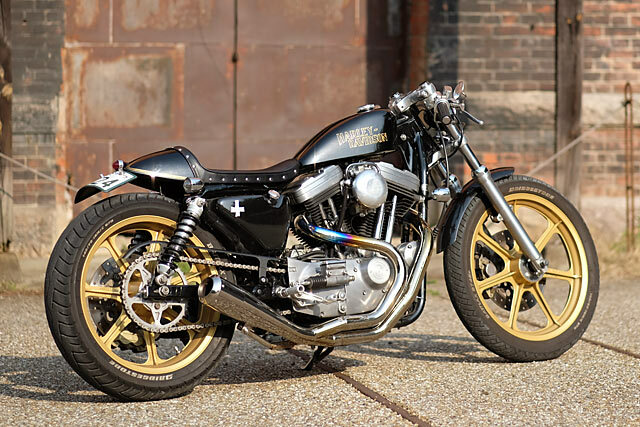 While shops may work with an upholsterer or painter to help their project look it’s best, we very rarely see multiple builders working together on the same bike. Well, now its time to try something a little different. Namely, a three-builder collaboration. Sure, it could end up a dog’s breakfast. But what if instead it took the best skills of all three players and ended up with something superlative? 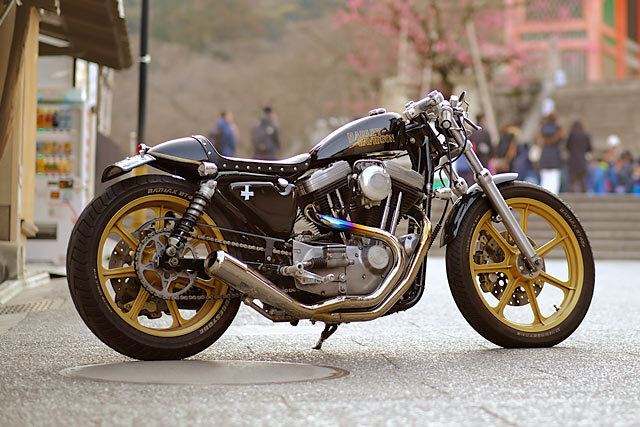 Here’s a clearly superlative cafe racer HD 883XL from Kyoto’s Hirock, by way of Nice Motorcycles and Plus Cycles, too. 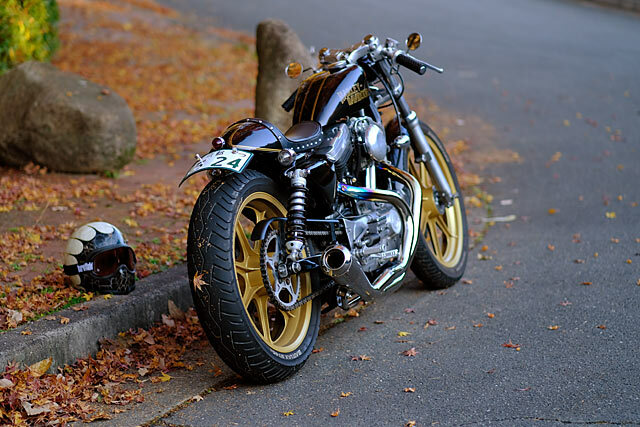 Not having the time to start a bike build from scratch, Hiroshi approached local builders, Nice Motorcycles (love that name) and worked with them to build the base bike he would then continue to modify. 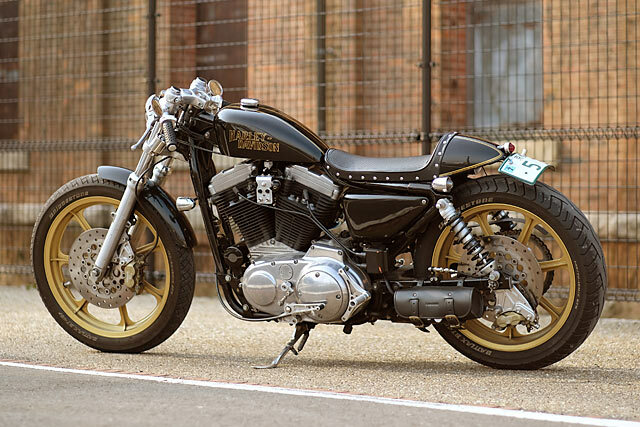 “Nice MC specialise in choppers, but they also had quite a few cafe builds under their belts, too,” he says. So they laid out plans for an 80’s style black and gold cafe, complete with Nice’s signature pin striping work. “After many meetings and tweaks, we were done. But even after a very short time with the new bike on the road, I realised that I was still wanting more performance. Both engine performance and cornering performance.” Hiroshi then thought long and hard about exactly what he’d modify and what he’d keep. Totally satisfied with the bike’s looks, he didn’t want to throw the baby out with the bathwater and end up with a bike that went like greased lightning but had lost all of its beauty. 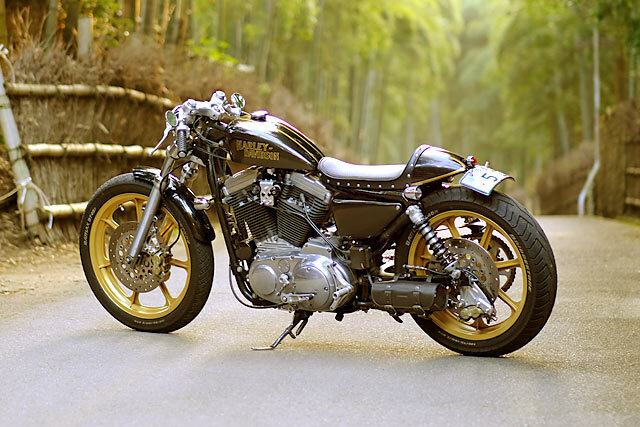 After even more brainstorming, it was decided that the power plant would be subbed out with a Buell X1 Lightning unit. From our calculations, that’s a jump from 50 horses to almost 90, and more than doubling of the original engine’s torque. We bet Hiroshi-san wasn’t left wanting after that. 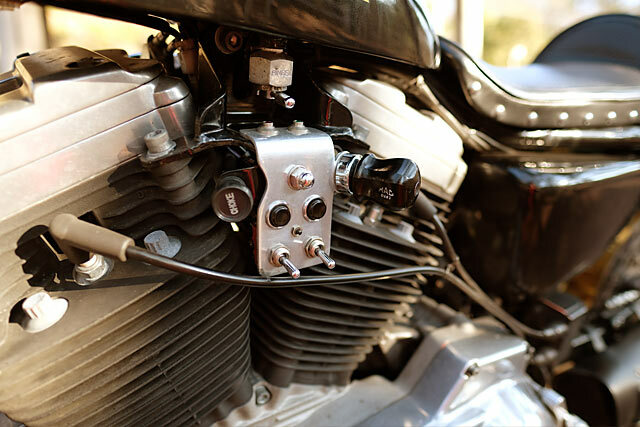 “The carb was replaced with a Mikuni HSR42, which was especially designed for big twins and made a real difference to the engine’s performance. 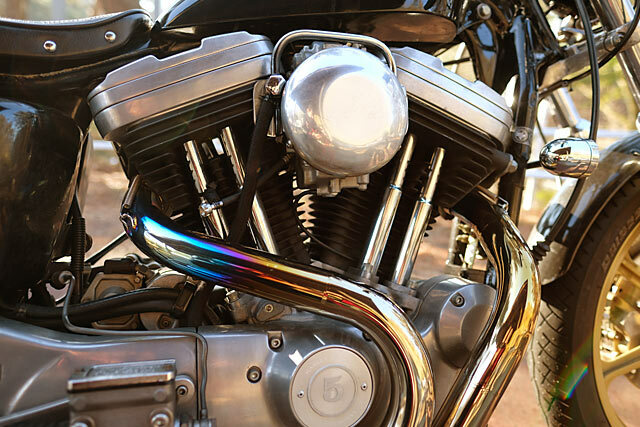 While we had the engine in pieces, we decided to use the original 883 crank as it’s slightly bigger mass gave the engine a torquier feel.” And as is always the way, the newfound power showed up the bike’s rather average handling. This was quickly remedied with a set of rears bouncers from its 1200cc older sister, which raise the tail a little and gave the bike more travel before it hit the bump stops. Finally diverting his attention away from the go-faster parts, Hiroshi and the Plus Cycle team took to tweaking. The old Dunlop Elite IIs were replaced with Bridgestone Battalax hoops. And the bike’s previously tiny rear wheel was replaced with an 18″ rim to more closely match the 19″ front and add to the bike’s cafe look. 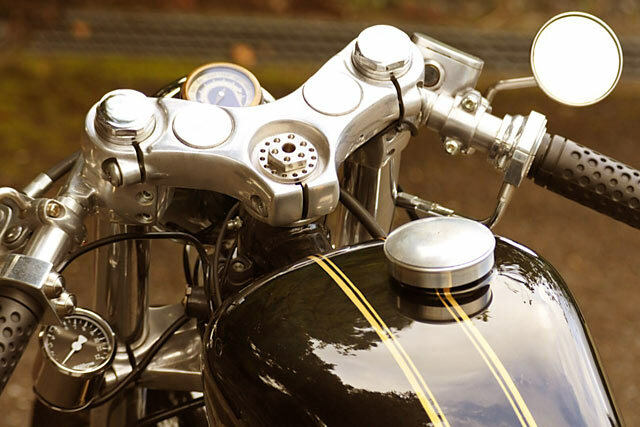 Then the number plate was moved from a side-mounted location to something more resembling a rear guard, and a retro Motogadget MST Vintage speedo was mounted inside the bike’s existing headlight. And then it was done. 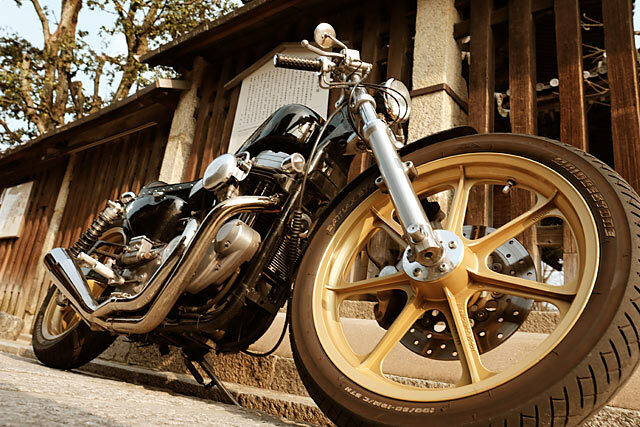 On his first ride of the new bike, Hiroshi was finally content with the Harley’s power, handling and as always, its looks. But no surprises for guessing what happened next. Anyone who’s upgraded to a more powerful bike will know full well that the rush it gives you, like alley-bought narcotics, wows you at first but quickly loses its effects. “I just want to raise the power a little more,” he suggests, with all the naivety of a true addict. Sure, Hiroshi. Just one more time.